New Delhi: All eyes are set on the Union Budget 2018 which will be tabled by Finance Minister Arun Jaitley in Parliament at 11 am on Thursday. It is the last full-fledged Union Budget by the BJP-led NDA government ahead of the Lok Sabha elections slated for 2019.
points, or 0.47 per cent, to 36,136.40 in opening trade. 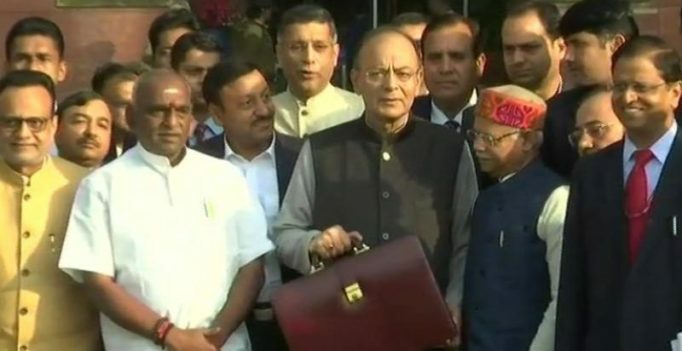 9:55 am: Finance Minister Arun Jaitley arrives in Parliament with the Budget document. 9:50 am: Finance Minister Arun Jaitley meets President Ram Nath Kovind at Rashtrapati Bhavan before presenting the Union Budget 2018-19 in the Parliament.